If you are in the market for a new mid-range smartphone in the US, you can now get the Moto Z2 Play in the US for just $239.76 instead of $408. Leading US retailer Best Buy has discounted the Verizon Moto Z2 Play version on an installment plan from $17 monthly to $9.99 monthly for a period of 24 months. There is no requirement of an upfront payment, so you can save a total of $168 compared to the smartphone’s recommended retail price in the US. 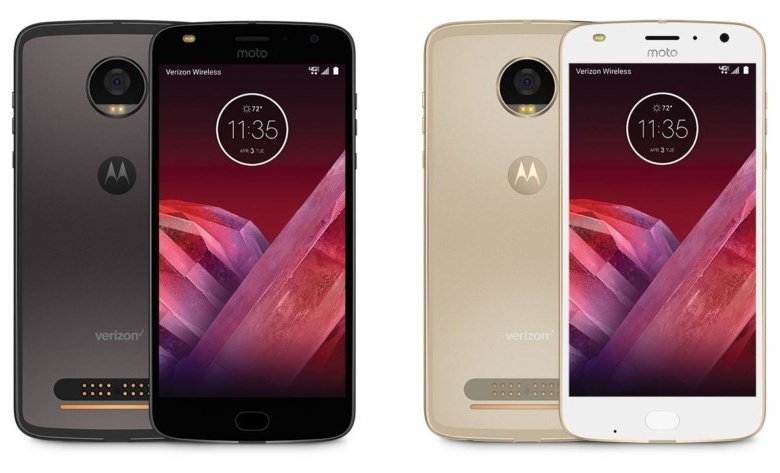 If for some reason you do not wish to get the Moto Z2 Play from Best Buy, you can also choose to purchase one directly from Verizon Wireless online or by visiting your nearest Verizon store. Launched in June this year, the Moto Z2 Play features a 5.5-inch AMOLED display with 1080 x 1920 Full HD resolution and Corning Gorilla Glass 3 protection. It runs on an octa-core Qualcomm Snapdragon 626 processor clocked at 2.2 GHz, with an Adreno 506 GPU. In the memory department, Verizon Moto Z2 Play comes equipped with 3GB of RAM and 32GB of built-in storage. For further expansion, you do get a dedicated microSD card slot. The rear camera on the Moto Z2 Play is a 12MP unit with phase detection autofocus + laser autofocus technologies and an f/1.7 aperture lens. In terms of video, the smartphone is capable of capturing 4K Ultra HD videos at 30 frames per second and 720p HD slow-motion videos at 120 fps. For selfies, you get a 5MP resolution snapper with 1.4um pixel size and a dual-tone LED flash on the front. Connectivity wise, Moto Z2 Play offers Wi-Fi 802.11 a/b/g/n, Bluetooth 4.2 Low Energy, GPS with GLONASS, NFC, USB 3.1 Type-C port, and 4G LTE. Like most modern mid-range Android smartphones, the Moto Z2 Play does include a fingerprint sensor as well, embedded inside the physical home button below the display. The battery inside is a non-removable 3000mAh unit with support for Qualcomm Quick Charge 3.0. Motorola claims it only takes 30 minutes for the battery to achieve 50% charge. On the software front, Moto Z2 Play currently runs on Android 7.1.1 Nougat OS, but Motorola has promised an upgrade to Android 8.0 Oreo. Unfortunately, the company hasn’t revealed when the update will begin rolling out, so be prepared to be very patient. Motorola was my first phone, And I've bought this phone for its memory. I liked its overall performance, sound quality, and look are awesome. But I little bit disappointed with the front camera.